So Who Exactly Needs an Elvish Translator? 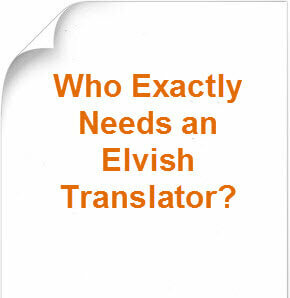 Home: Translation Services: So Who Exactly Needs an Elvish Translator? There are simply thousands of languages that are currently in use throughout the world most of which can be translated into any other language as translators over the centuries have found suitable words in the different languages which have the same meaning when used amongst the language speakers. It has taken in some cases hundreds of years to formulate the languages that are in use today as languages evolve and develop through the eras. Most languages that are translated between each other are well known entities but recently one translation services company in Australia was confronted with an interesting proposition by email and that was to translate an English document into Elvish. The translator confronted with this proposition took it upon herself to respond in the normal way to any translation assignment but she knew that Elvish was a fictitious creation of J.R.R. Tolkien, the author of the Lord of the Rings trilogy based in a fictitious country called the Kingdom of Middle Earth. She realized that the request was done totally tongue in cheek, so she responded in exactly the same way. In order to be able to conduct an appropriate translation she said that it would be necessary to book a return trip to Middle Earth to undertake research and viewing time of the Lord of the Rings trilogy, which would make the translation cost $1,345,654 including accommodation, food and transport. She said that using a NAATI translator would guarantee the highest standard of English to Elvish translation. This is because Elvish is not her native language and she would have to undertake research to be able to translate the document from English to Elvish. She provided this breakdown to the person making the request but, surprise, surprise, she got no answer!